"Mommy's going to totally kill me." My obsession with colored strands started with Katy Perry, who debuted her slime-green color on Instagram earlier this spring. That a girl with brunette strands could so seamlessly adopt hue-happy hair made me instantly take notice. Maybe, just maybe, my pastel dreams could become a reality. Luckily, my brother is also my hairstylist, which means I have the ability to experiment and play with my mane. On a routine visit to his salon, I confessed my colorful-hair wishes to Kopie, who introduced me to L'Oréal Professionnel's Hair Chalk. "It's an in-salon color that doesn't require bleach," she explained. The shade would last anywhere from two days to two weeks, depending on your hair health. So, after a sit-down session with Team Beauty at R29, it was decided: I was going to try out not one, but three of the hair-chalk hues. I was going to color my locks the shades of the sunset. I booked my appointment and waited. Fast-forward to one week later, and I'm sitting in that aforementioned chair with Billy and Kopie. The colors we'd decided on were orange (a mix of Coral Sunset and Bronze Beach), pink (Sweet Sixteen), and purple (First Date Violet). Kopie said that since I already had lighter highlights the color would go on more easily and stay on longer. "The colors will also be more or less opaque, depending on how many times you paint over," she explained. As far as pricing goes, Kopie explained Roman K Salon would charge $55 for the type of highlights I was getting. "If you're doing an all-over color, the price would be a bit more," she said. The first step of the application is the exact same as regular color: Kopie painted on the shades with a color brush. But, before moving on to the next section, she'd sic the blowdryer on it. "The heat seals in the color and helps it adhere to the hair cuticle," she explained. This is how it went, section by section, for about a half-hour. After a quick shampoo and a blowdry, I was finished. For a non-bleach dye, this stuff has some pretty good color payoff. The hues popped without being overbearing, and Kopie did an incredible job with that faded, ombré-style technique. I looked just like the pastel-haired girls in Pinterest photos who I'd always hoped to resemble. Over time, as the color started to wash out, I noticed it didn't leave behind much residue. It never caked onto my brushes, it didn't tint my bathtub, and even though some of the color transferred onto my white towels (whoops), the stain came out immediately. The way it faded was even gorgeous — I actually enjoyed the colors more as they started to wash out. That said, this stuff stuck around. A month after I first got dyed, I went to another salon for an ombré touch-up, and the colorist asked how long ago I'd dyed my hair red. Talk about staying power. There was one major drawback to this stuff, though: the texture. I noticed it the second I went to style my hair for the first time with the dye in. Although its site boasts zero chalky feel, the product definitely seemed thick on my strands. Trying to get a brush through it was also pretty difficult. The chalkiness abated the more I conditioned my hair, but the texture was obvious for at least a week post-salon. That minor setback aside, this is one product I wholeheartedly recommend. The range has eight colors in all, from pink to green to black. 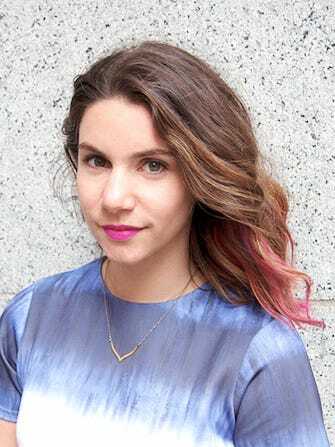 It's especially great for anyone who wants to give the pastel-hair trend a go without the commitment. 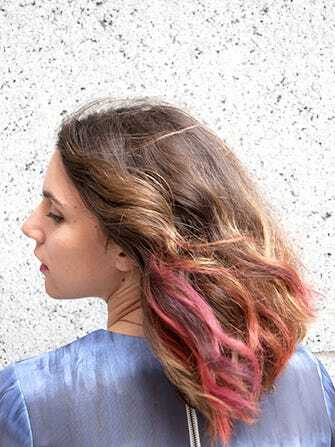 The process is available in-salon only; visit L'Oréal Professionnel's website to find the nearest spot to give you rainbow strands. As for me, I'll be testing out more colors in the future. My mother is hesitantly supportive. Photographed by Meagan Long; Photographed by Meagan Long.